[Moscow, Russia, October 3, 2018] VimpelCom (Beeline brand) and Huawei held a demonstration showcasing the latest fifth generation (5G) mobile connection technologies. 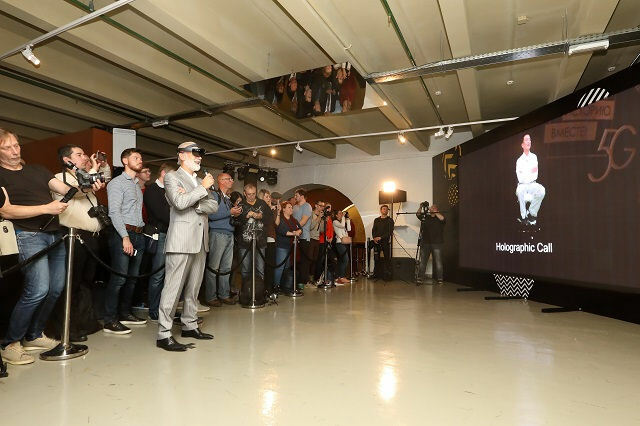 The Moscow Museum exhibition hall was used as the demonstration zone and the dialogue between the speakers was conducted using a hologram – a digitized image transmitted through Mixed Reality glasses (MR). Holographic communication technology requires high bandwidth and low latency, which will only be made possible by the mass deployment of 5G networks. A commercially available Huawei 5G base station – the gNodeB – was used to make the holographic call. The base station consists of an active antenna array (HAAU 5213) and a new generation of BBU5900 digital processing module with a 5G board. The radio interface uses TDD mode in the 100 MHz frequency band and MIMO 64×64 technology. One of the first commercially available 5G CPE devices based on the Huawei Balong5G01 chipset is selected as the subscriber terminal, which includes an RF module (ODU) and 5G/WiFi router (IDU). Beeline and Huawei also demonstrated a practical 5G virtual reality (VR) use case using an online broadcast from a 360-degree camera housed in a VR helmet. The technology can potentially be used to enhance user experience in terms of remote travel. For example, Beeline customers can visit an operator’s shop, acquire a tariff plan, or buy a smartphone, while physically located in the comfort of their own home.